The season tickets I mean. 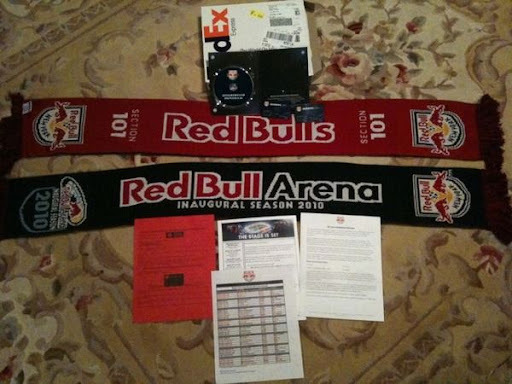 RBNY season ticket holders have begun receiving them today. The above picture, courtesy of Rev_Hooligan, is our first look at what is in the package. As you can see, the above scarves are imprinted with the holder's section which, in the case of Mr. Hooligan, is 101. You can also see the informational DVD and the season ticket "smart cards" in the above picture. The club announced today that Giorgi Chirgadze, the first ever Red Bulls Academy player signed, has undergone hip surgery and will be out for 4-5 months. This should mean that there will be an open roster spot while Chirgadze is on injured reserve. Red Bulls superstars Juan Pablo Angel and Jeremy Hall will be appearing at Premier Soccer Shop in Hoboken this coming Sunday, March 14th. They'll be signing autographs from 1-3pm. Premier Soccer Shop is located just blocks away from the Hoboken Path Station at 157 First Avenue. I'm told they'll even have the new Red Bulls jersey in stock. Here's some important Red Bull Arena parking information from JBigjake, posting on Big Soccer's New York Red Bulls forum. We've also just received word that MMM Bello's, the Garden State Supporter's hangout, will be kid friendly until 11pm on gamedays and will have beer starting at $2. Finally, here's a look back at the Red Bull Arena job fair, courtesy of Red Bulls Reader.